It’s funny how the most random things make us rethink other things we take for granted. Take kneeling, for instance. That’s right; kneeling. Pretty insignificant, you might argue, but to someone who can’t kneel–or even bend their knees, for that matter–even if it’s just temporary, it’s the difference between living life freely and trying to live it freely despite some constraints. Last Friday, after my parents’, um, nagging, I finally decided to go to the Doctor’s to get some mole on my knee checked out. Even though we’re about 99.9% it’s nothing, I always had a tiny voice in the back of my head saying, “it’s better to be safe….” Besides, what was curious about this mole in particular (unlike the many other “normal” moles on my skin) is that it started out as a normal-looking red thingy (like a blood clot?) many (yup, many) years ago but grew bit by bit and became darker/blackish overtime until finally stopping to grow some time ago. On Friday, it was smaller than a pencil eraser. So I described this to my fantastic and darling doctor (she also treats my mom and dad, and she’s so cool, straight-forward, and knows everything) and she, too, is 99.9% this mole is completely benign. But she nevertheless performed a thing called a punch biopsy (my needle was “an 8,” i.e., 8mm) to be completely, absolutely, and 100% sure it’s nothing to worry about. I took this pic just a day after I got these stitches. Find an Update at the bottom. Because of the local anesthetic, it really didn’t hurt for the most part. 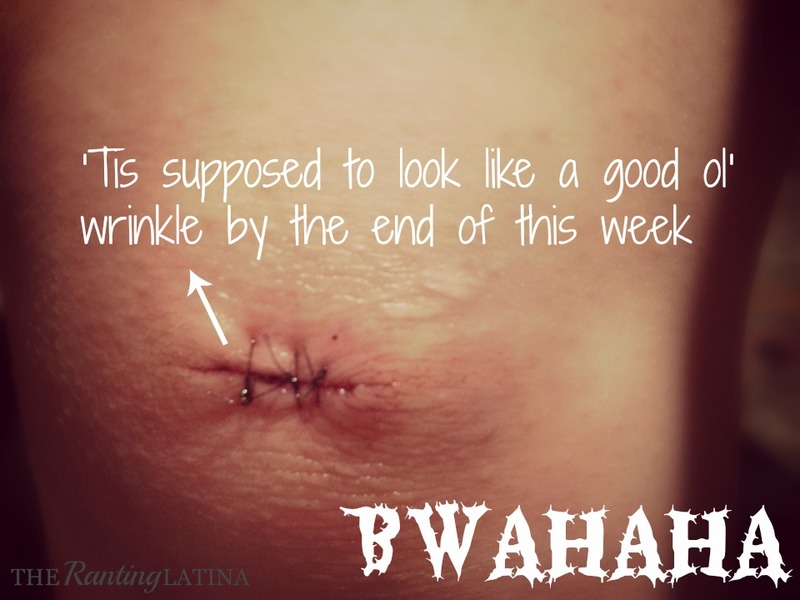 There were times where it stunnng like crazy but I’m a big girl (or, as my doctor put it, “I have thick skin”–literally), so I took it like a big girl. After the “operation” (?) I got stitches, and I have to admit I was a tad excited because I had NEVER gotten stitches before :). (Yes, I’m amused by the oddest things..) However, my doctor explained these “weren’t surgical stitches” (way to rain on my parade! haha), but oh well. Then after the stitches, I got some gauze put on and I was told to NOT KNEEL or do otherwise strenuous knee-related exercises for some time (maybe a few days? I kinda forgot) so that the stitches can do their thing properly. (And also that I’d get them taken out a week later.) Fortunately, my elliptical workouts would be safe after a couple of days. But anyways, you guys, not kneeling is difficult. That same day my dad and I went to do a little shopping for my mom and became enamored by the TUMI store. I was so enamored, in fact, that I ended up kneeling (for, like, the first time that day, which was somewhat of a relief, actually) to check out something that was closer to the floor. I immediately realized my mistake, felt like a dummy, and began to pointlessly rub my knee. Also I like to sit crossed-legged on the couch to watch some TV in the evenings, so it took some adjustment to keep my legs as not-so-rigidly-bent at all times. Not out-of-sight, so definitely not-out-of-mind; that’s for sure! But I’ve getting used to it. And fortunately I won’t have to get used to it for very long because this body that God’s given me is friggin’ awesome and knows how to heal itself very fast. (May He also bless lavender essential oil which def helped the thing close up a bit faster. Modern medicine is wonderful too, though. So I sympathize with every person out there who, for whatever reason, has lost their ability to kneel permanently. Kneeling, like every ability God’s given us, is a gift, a blessing. And I’m thankful for those of us who can take advantage of everything else we’re able to do. But kneeling and bending my knees is just one thing I’ve learned to never again take for granted. Writing is another–mainly because I’ve somewhat lost the ability to write with my dominant hand. More on that in another post. What’s one thing YOU have also learned to not ever take for granted and why?